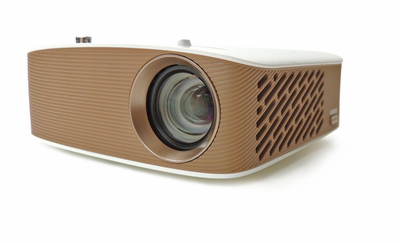 The Flare150 is very convenient, battery operated projector that is small and can be taken on the go. It can project crystal clear images from as close as 4” and all the way to a mural size. It can even be used by only dimming lights instead of shutting them off. This is the perfect battery powered projector for an on the go artist. ARTOGRAPH Flare 150 Art Projector is a rechargeable art projector that can be taken anywhere and can provide the clearest images. There is no reason an artist has to be without their artwork. With the Flare 150, a flash drive or wireless screen sharing feature can be used to show off the artist portfolio. The Flare150’s wireless screen sharing feature can be used with Windows or Android devices. Some of the specifications of the Flare 150 are the multi voltage AC/DC adapter and the great thing about that is it comes with a rechargeable battery. The dimension of the Flare 150 are 4.23 inches, the width is 4.06 inches and only weighs .6 pounds. The LED lamps are almost maintenance free and last up to 30,000 hours. For portfolio sharing there are two ports which are HDMI and USB. The projection has a far range from 4 inches to 100 inches. For composition and layout, there is a two battery operation and 22 built in grids. The image and color controls that come included with the projector are color to black and white, image flip, reverse view, keystone correction, and color temperature control. A fully functional remote comes with the projector and also a tripod mount connection for easy set up. The Flare 150 can be used for drawing, painting, and displaying and provides the clearest projections. Because of the projection options, it can even show the different aspects of the images and the many steps that take place in the creative process for the perfect presentation. The setting options it comes with lets the artist save the view that is needed, whether it be with high or low contrast, gray scale to see tonality, and even the edge enhancement can help emphasize details. Another great feature about the Flare 150 is the picture settings that let the artist present the images the way they are wanted down to every aspect that is needed to see during the art creation process. All of these settings can be customized and if it needs to be cleared, the artist can hit BLANK and that will white out the projector. Optional Artograph STAND - DIGITAL PROJECTOR TABLE stand for vertical projecting from overhead onto your drawing table is available here too.